Jonathan Gold knows a thing or two about Southern California food. (He no longer is with us, though his legacy and influence remain.) The Pulitzer Prize-winning food writer once named Golden Deli one of L.A. area’s 99 essential restaurants. Located in a strip mall in the food mecca of San Gabriel Valley (SGV), doing business since 1981, it routinely draws legions of ardent customers who are willing to wait for a half hour or more to get seated. I’ve eaten here several times when visiting relatives nearby. Though the menu is substantial (intimidating actually), Golden Deli is popular for its pho. The broth is well-balanced and soup noodly, by which I mean that Golden Deli is very generous with the rice noodles. If the soup isn’t eaten fast enough, the pasta will soften and swell to fill up the bowl. A solid pho. On warmer days especially, bun calls out to me, a salad of cold rice noodles, plenty of lettuce and bean sprouts, herbs, nuoc cham dressing and choice of topping. GD makes one of the better bun thit nuong (charbroiled pork). Instead of more common do chua, pickled scallions provide the familiar vinegary-sweet accent. And praise to the kitchen for scattering fried shallots on top. I can’t have enough of the stuff. Bo kho (beef stew) is another Vietnamese specialty, similar to French pot au feu but with Vietnamese flavors, served with either banh mi bread on the side or ladled on rice noodles, take your pick. Five-spice, tomatoes, curry powder and lemongrass are the usual broth ingredients. The broth made at Golden Deli is intensely reddish-orange in color, likely from annatto, and thinner than some but complex and delicious. The beef is meltingly tender, accompanied on a recent visit by a single carrot. More would’ve been nice. 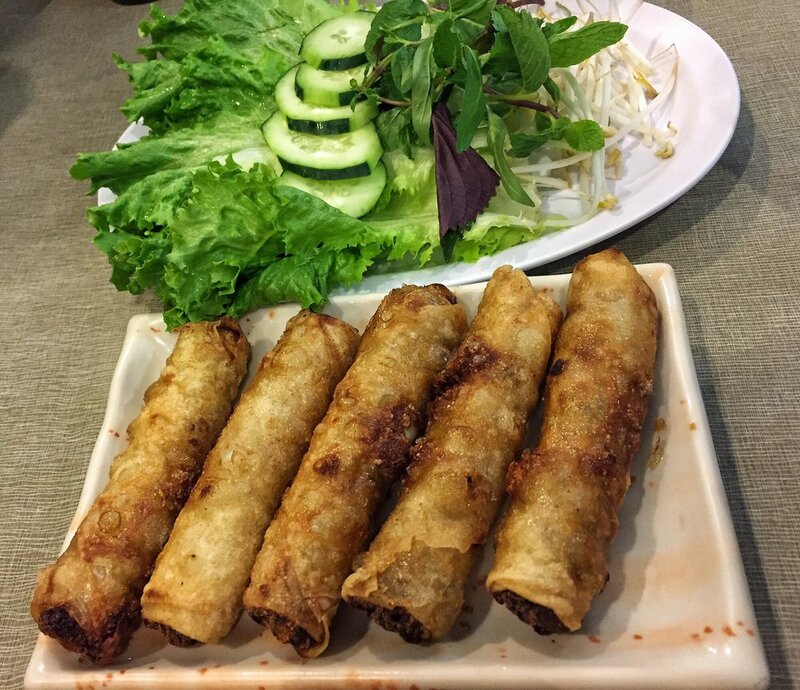 Customers sing praises of their cha gio, otherwise simply referred to as egg rolls. It’s a superlative version, savory and bigger than most versions, an umami bomb of ground pork and woodear mushrooms. These are not delicate, bite-sized pieces either, but bigger than cigars. Oily on the surface, their fried rice paper skins are shatteringly crispy if not aesthetically pleasing. Fresh lettuce and herbs come on the side: mint, cilantro, perilla leaves, bean sprouts, sliced cucumbers. Eaten by itself or wrapped in lettuce with herbs and dipped in nuoc cham, Golden Deli’s cha gio is impressive. The general consensus is that Banh Mi My Tho rules in the 626 area code for their namesake sandwiches. Lost in its encyclopedic menu is Golden Deli’s own that if for no other reason than its perfect bread surely should be regarded as royalty in this highly competitive market. It’s the kind of bread that’s supple on the inside and so crackly on the outside that shards rain down on the table and clothes with every bite. While one can argue that this place or that in SGV serves a better such-and-such, for sheer variety and quality, Golden Deli continues to hold court. My 9-year-old grandson loves reptiles. He’s fascinated so much he takes pictures of all of them at the Los Angeles Zoo, every single time he visits, to the exasperation of his younger sister. It’s no surprise then that he wanted to go through the reptile (and amphibian) exhibit when my wife and I took both our grandkids to the San Diego Zoo recently. I find frogs more interesting if for no other reason than their extraterrestrial appearance. I saw this pair that look straight out of a sci-fi movie. I failed to note what they were called. Update: the San Diego Zoo was kind enough to answer by email inquiry. This frog is commonly known as White’s Tree Frog, otherwise known as Litoria caerulea. A Weighty Question—Does Windy City Pie Have Seattle’s Best Deep Dish Pizza? Do I like Chicago deep dish pizza? At one time, the answer would’ve been an emphatic ‘no,’ not because I tried it (I hadn’t) but any pizza thicker than a half inch and crust not made with “00” flour with its low gluten and crackly edges was not my preference for a great pie. That was before I had a sample of a deep dish pie at Patxi’s in Seattle that someone else ordered. It had no meat, just tomato sauce, spinach, pesto and cheese. Surprisingly the cheese wasn’t on top but underneath a chunky tomato sauce, as is the custom in Chicago. And it was thick and hearty, best eaten with knife and fork. The first bite shattered my prejudice of what makes a good pizza. Last Friday, my son-in-law got takeout from Windy City Pie, which specializes in Chicago-style deep dish. He walked in the door with a single box roughly a foot square, which if it were ‘traditional’ pizza would barely satisfy the four of us. But the content was something to behold, easily an inch high, a massive pie smothered in thick, bright tomato sauce and edges charred as if left in the oven too long, clearly not what a pizza is supposed to look like. The crust was more bread-like, closer to dense cornbread in texture with some chew. The bottom was darkened brown by a hot pan and crunchy enough to be challenging to cut with a knife. The edge around the pie and spots on top were blackened. At first you might think this was carelessness on Windy City’s part but it replicates what some pizzerias in Chicago and Detroit made famous, a cheesy, frico-like and heavenly quality. I love a zesty tomato sauce; Windy City didn’t disappoint. House-made sausages were in large, tasty chunks. Best on top on ‘traditional’ pizza where its crispness and paprika flavor can be appreciated, the pepperoni here stayed limp buried in all that sauce, which may explain why sausage is the preferred meat in Chicago. The Omnivore is a pie that’s worth the drive to Phinney Ridge. For next time, I’m eyeing the Classic that ditches the pepperoni, spinach and roasted garlic in favor of roasted red peppers and mushrooms. Vegetarians can rejoice with four specialty pizzas on the menu. Build-your-own is also an option. Windy City Pie has the best deep dish pizza in the Seattle area. Might it hold its own against competition in Chicago? I wouldn’t bet against it. As of this writing, it isn’t yet open for dine-in business (TBA). Orders must be made online and picked up (Wednesdays-Sundays, 4-9pm). Update (April 1, 2019): Windy City Pie is officially open for walk-in business. Also: The same folks who run Windy City have a sister operation, Breezy Town Pizza, in Seattle’s Beacon Hill neighborhood, located inside Clock-Out Lounge where beers, cocktails and other beverages can be ordered. The menu is not quite the same as WC though the Chicago- and Detroit-style (though not as thick) is on it with the same charred, cheesy rim. The crust is a proprietary sourdough recipe. One bite of the PPC (Pepperoni Paint Job) had me convinced that the pizza gods have blessed Seattle with another winner. The Northwest experienced its first snowstorm of the year this week. Another is on the way. Despite being a headache for everyone, there are moments of beauty that take your breath away. These icicles formed under one of the eaves of my roof as temperatures went slightly above freezing during the day and the relentless drip of water created these spectacles. Shanghai Cafe remains my go-to Chinese restaurant even as new ones open in the Seattle area. My wife and I tend to order the same things every time, menu items that have stood the test of time over the 20 years we’ve been customers. (You can read about our favorites here.) Years ago, one of the long-time waitresses kidded us on our (almost) unwavering selections. Last night for dinner, as the year’s first snow started to fall, we decided to give a new dish a go. I want to enthuse about their Beef with Black Bean Sauce. After the first bite, it was obvious that this would join our other favorites, a dish so savory and funky from fermented black bean sauce that all my wife and I could say was ‘Mmm.’ Many Chinese restaurants seem stingy with this condiment as if to insinuate its flavor. Douchi should be the star, not a shrinking violet. Dishes using it should be emphatic like chicken with black bean sauce at Yea’s Wok, refinement be damned. For the same reason, I downgrade restaurants that use pesto to color its pasta green rather than generously sauce to highlight basil’s herbal and pungent qualities. There were enough mushrooms to compete with beef slices in volume, maybe a cost-cutting measure. Yet they were perfectly cooked without being spongy while adding their own earthy flavor. Basil leaves lent nice anise notes and color. Despite the sauce verging on being too salty, tempered when spooned on steamed white rice, I’ve found another gem at Shanghai. I’ve said before that Shanghai Cafe is unsung and under-appreciated. For good reason, it’s lasted decades at the same location in the Factoria commercial area of Bellevue. For sure my wife and I try new Chinese restaurants but seem always to return here because it’s comfort food. Likewise to my daughter and her husband who crave Shanghai’s vegetarian options whenever they’re in town. My wife and I have never driven I-5 through the Northwest in October. This year we did, en route to Southern California. The autumn leaves were gorgeous all along the interstate, mostly yellow with occasional spots of orange and red. They helped break up the monotony of having gone this route many times before. When I was in Southern California it dawned on me that we’d be passing through Portland later in the month on the way home. I tried to keep a close tab on the fall colors as they were developing in the Japanese Garden. Trying to find out the current status of the maples wasn’t easy. The website japanesegarden.org didn’t do frequent enough updates to be helpful. So fortune would have to shine on us and it wouldn’t be too late by the time we got to Rose City. As it turned out this year, for best color, the third week was probably best. Yet when we arrived the following week, fortunately there was plenty to admire, in particular the stunning lace leaf maple whose glory I was able to capture on camera. Here is a view from a slightly different angle. Portland’s Japanese garden is recognized as being the finest outside Japan. I’ve seen it grow and mature over the years, infrequent though my visits have been, and become the breathtaking ambassador it is today. My last time here was in early October 2013, a bit early for best fall color. So it was with great anticipation and fingers crossed that my wife and I arrived on Sunday (October 28). Because it was two hours before closing, we had to keep up a faster pace than we wanted, but we were still rewarded with splendor. The forecasts for thundershowers didn’t materialize; there was only an occasional sprinkle. After leaving, we headed straight to Ataula, one of our favorite restaurants in Portland. Not wishing to get stuck in Portland’s awful rush hour traffic on Monday morning, we got a room for the night in Vancouver, Washington, just across the Columbia River. Pan My Smart Phone? Definitely! One thing I can’t do with my DSLR is take panoramic shots. I like them for their more encompassing record of what I saw, a way to capture the surroundings more than a single exposure can. Using a wide angle lens may not always be the solution; an interesting background tends to recede with shorter focal lengths. I take a series of partially overlapping handheld shots, sometimes as many as a dozen depending on the subject, with the camera controls set to a constant EV value (manual mode). Image-editing software does the stitching. The steps are a bit involved. Below are some examples. It’s therefore a huge convenience that smart phones can do the work for you. For those unfamiliar with how this works, select the panorama function in the camera settings, then sweep the phone in a steady arc (horizontally or vertically) until done. It’s basically doing what I do with the DSLR except that the camera uses built-in intelligent software to create a composite. In my previous post, I indicated that I inherited an iPhone 6s, so I took this test shot. Despite some cylindrical distortion (not unusual for panos even with DSLRs), I was happy with the result. For what I need this function, it’s perfect. No extra work on my part. Life just got less complicated.